This is a collection of satirical cartoons about the election of 2016 and the president himself. In true MAD Magazine style, some are one page and some are several page long comics. Some jokes land, some jokes miss, and some are kinda gross - also MAD Magazine's style - but humor can be very subjective. I personally wasn't too keen on some of the art styles but that's cause I didn't find them pleasant to look at; not because they were poorly done. If you're an overly sensitive person and will trash this just because it's making fun of Trump, feel free to skip this. 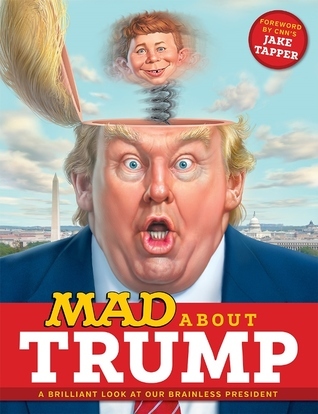 MAD Magazine is not a publication for people who can't take a joke and they to NOT hold back. I found that absolutely refreshing but others may not. All the parodies are here; Beauty and the Beast, La La Land, Suicide Squad, Civil War, and while I may not have laughed out loud, I did chuckle at the cleverness of a lot of them and the publication as a whole is a welcome bit of levity among the absolute mess American politics has become. I'll have to give it 2 or 3 more reads to catch all the little jokes (seriously, some of them are like those Highlights Magazine hidden picture pages but for adults) but I had fun reading this. 4 out of 5 for it's unabashed and scathing honesty.